I know you are, but what am I? The Eight of Wands represents Fall. Falls are best viewed as learning experiences, because it's only if you can gain strength from them that you can rise again. Paul Reubens had a life before and after Pee Wee Herman. Maybe some day he'll create a character as popular as Pee Wee was. It's a good bet he'll never get to do another children's show, however. 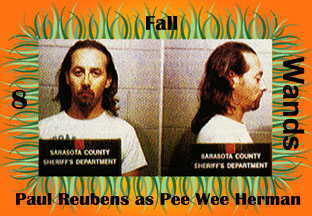 Paul Reubens's mug shots are imprisoned at Kevin's Fun Pee Wee Page!.